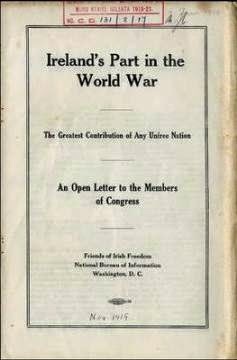 The document of the month from MilitaryArchives.ie is a pamphlet, written by Willard De Lue, chief of the Information Section of the Irish National Bureau in Washington. Written in late 1919, De Lue sets out to debunk the notion that Ireland made little contribution to the Allied cause in World War One. In the three pages of text, De Lue sets out calculations, drawn from British sources, that show 5.3% of Ireland's total population enlisted under the British flag. By comparison, he says under 4% of the USA population made up the US army and navy. He also argues against received British wisdom that Ulster Unionists made up the bulk of Irish recruits. He says that of the 123,585 men recruited in Ireland, 'at least 90,000 were not supporters of Sir Edward Carson', and adds that while 1.36% of the population of Unionist Antrim and Down signed up, Republican Kilkenny, Waterford, Wexford and Tipperary recorded 1.70%. It's an interesting diatribe based on contemporary statistics. The pamphlet is part of the Bureau Of Military History's Contemporary Documents collection. It can be downloaded here. Incidentally, the Military Archives intends to redesign the Home Page of its website and is asking for users of the site to make contact with Cathal Brugha Barracks if they have any ideas for improving access and navigation.